Long after most other flowers have called it quits, chrysanthemums are perennials that persevere long throughout the fall — which is of little surprise, seeing as how these flowers have fought to survive for thousands of years. It was 15th century BC that chrysanthemums were first discovered growing in their native land of China. But back then, you wouldn’t find these plants adorning walls or sitting atop tables. Originally, they were solely used as a medicinal herb. Over the years, they gained more and more popularity as a gift-giving flower, rather than a medicine. In the 18th century, chrysanthemums made their first voyage from China to Europe, with small towns and river communities instantly falling in love with them. It wasn’t until the late 1700s that chrysanthemums made their way into the United States after Colonel John Stevens imported a rather rare variety of “Dark Purple” chrysanthemums from Europe. We have Carolus Linnaeus to thank for two things, creating the modern-day system of taxonomy and coining the name chrysanthemum. Who knew? With over 40 known species of chrysanthemums, it’s not surprising that there’s a lot of diversity among these plants. Stems range between two and six inches, with blooms ranging from 0.4 to 10 inches in diameter. 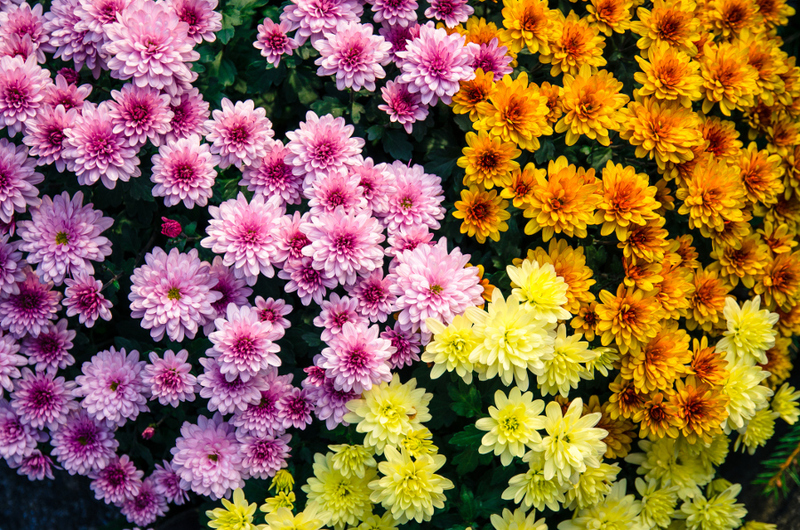 Today, chrysanthemums can be found in multiple colors, including purple, red, and pink. But that may not have been the case years ago. The word “chrysanthemum” comes from the Greek words “chrysos,” meaning gold, and “anthos,” meaning flower. Chrysanthemums do a lot more than just look beautiful. Chrysanthemums were once used to treat chest pain, high blood pressure, headaches, and dizziness. Want to get the November baby in your life something truly special? 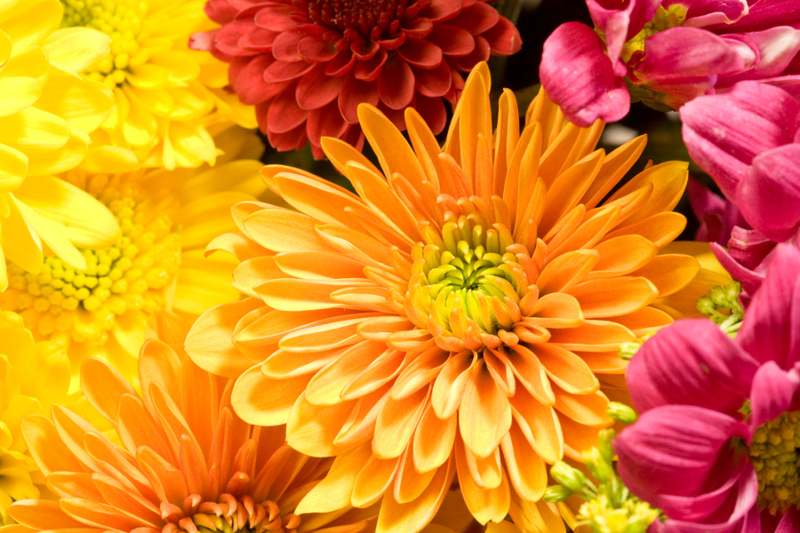 Chrysanthemums are the November birth flower. Ever wondered how chrysanthemum flowers get their full-figured look? It turns out, the flower head is actually a cluster of multiple flowers. In America, chrysanthemums have long symbolized fidelity, optimism, joy, and a prosperous life. In China, chrysanthemums are held in such high honor that they gained a spot as one of the “Four Gentlemen of China” — a group of prestigious plants that each signifies a new season. Due to the time they bloom, chrysanthemums signify autumn. Across the Pacific Ocean, in Japan, chrysanthemums are so respected that the Emperor’s throne is referred to as the Chrysanthemum Throne. Naturally in bloom during the month of May and ending in “mum” has made chrysanthemums the most popular Mother’s Day flower in Australia. Because of this, chrysanthemums are also used to symbolize unbreakable love and fertility. But the flower doesn’t carry such a joyous meaning in Europe. Because of its prevalence in graveyards, chrysanthemums are associated with the passing of a loved one and are a common sympathy flower. Our beloved chrysanthemums have gotten a bit of a bad rep over the years for being a difficult plant to care for. But we couldn’t disagree more! In reality, all they need is a bit of well-drained soil, regular waterings, and a sunny windowsill. One of the only things you need to be on the lookout for with chrysanthemums is dead petals. If you notice even a single decaying petal in their glorious blooms, you should pluck it immediately. Even the most well-kempt chrysanthemum will inevitably begin to die at some point. But luckily for you, chrysanthemums truly are the gift that keeps on giving. Once your plant can’t survive in its pot anymore, cut the stem down to about six inches and plant it in the sunniest part of your garden. If planted correctly, they will continue blooming for years.